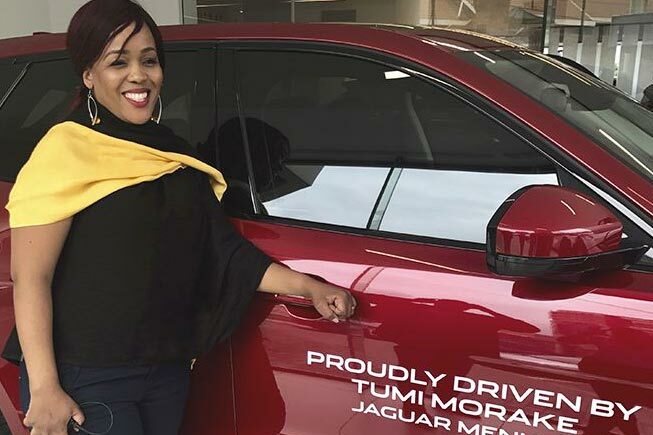 Popular award-winning comedian and TV star, Tumi Morake, has been chosen as a Jaguar ambassador. In partnership with Jaguar Land Rover Menlyn, Tumi will be driving a new Jaguar F-PACE – finished in Italian Racing Red, to perfectly suit her personality. Morake says she has always dreamt of driving a Jaquar since attending one of its launch last year. “I have always dreamt of driving a Jaguar and when I attended their launch last year, I had heart palpitations,” said Morake. The F-PACE combines Jaguar’s sports car DNA with the space and practicality of an SUV. It boasts class-leading interior space for passengers, as well as boot capacity of 463 litres – including a full-size spare wheel. When the rear seats are folded flat, the total cargo volume increases to a massive 1 553 litres. With underpinnings based on the Jaguar F-TYPE sports car and Jaguar’s Intelligent Driveline Dynamics all-wheel drive, the F-PACE offers a thrilling driving experience, with confidence and stability in all weather and on all-road surfaces. Dealer Prinicipal at Jaguar Land Rover Menlyn, Eric Vorster, says he felt Tumi’s bubbly personality and character is what made him feel that she was perfect to endorse the brand. “I first saw Tumi performing in May 2016. Her bold, edgy character and entertaining persona resonated with me, and made her the perfect candidate for a brand ambassador.